A plane that departed from Qatar’s Doha, carrying a British patient, made an emergency landing after stopping off at Trabzon Airport in northern Turkey on the morning of March 14. The German-flagged, Learjet 55-type ambulance plane issued an emergency warning due to a technical issue, asking to return after taking off from the airport in the Black Sea province. The airport was closed to flights until the emergency landing was completed. Fire crews and ambulances were dispatched to scene following the emergency warning. The plane landed successfully at 12:13 p.m., with 78-year-old Pauline Teresa and the plane’s cabin crew all evacuated from the plane. Teresa was taken to Trabzon’s Kaçüstü State Hospital for medical examination after evacuation. The Trabzon Governor’s Office issued a statement, saying the airport was reopened to flights after the emergency landing was completed without any problems. “Following the refueling, Trabzon Airport, which was closed to traffic after the emergency landing of the ambulance plane due to a technical malfunction in the air, was reopened,” it said. 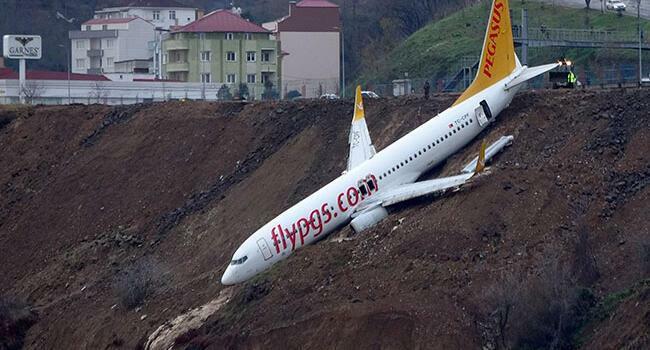 The same airport had also been in the headlines on Jan. 14, when a Pegasus Airlines plane skidded off the runway after landing and ended up halfway down a steep slope heading into the Black Sea. All 162 passengers and crew on board were evacuated safely after the accident, Trabzon Governor Yücel Yavuz had said at the time.